My darlings. The 15" mounds of snow are melting, the temperatures are creeping above freezing and I am starting a new job today. It feels like Spring has sprung I tell you. Aside from my fingers being completely raw from all of the manual labor I have been doing, I feel like a new woman. As you can imagine, my weekend was full of projects and things are starting to semi shape up. I can tell you one thing though, my office is an absolute garbage dump. How can anyone get inspired in a space that has 10 boxes of clothes that are halfway open and sprawled out all over the floor, shoes and documents everywhere? People. It is a complete and utter disaster. Once the ice has melted from my stairs outside, I can maybe bat my eyes at some boys to carry my massive dresser up the stairs so I can get some organization happening. A girl can hope. Once that does happen, some chic desk styling is going to take place. 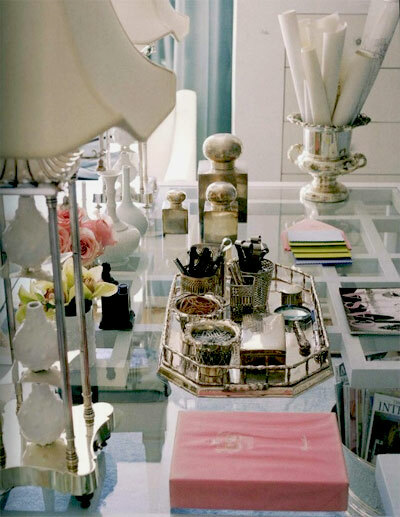 A chic desk is everything I need to stay organized and creative. Truly. 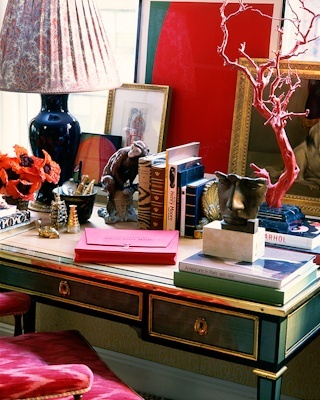 A little glam, a dusting of history and a whole lot of accessorizing is the key any perfect desk. I know you all love examples, so eat your heart out. Let's practice what we preach here, shall we? Get the look. Can't wait to see all you have been doing to your new house. I know it will look amazing. I have been wanting to spruce up my desk area too. Cheers to Monday. good luck at the new gig! 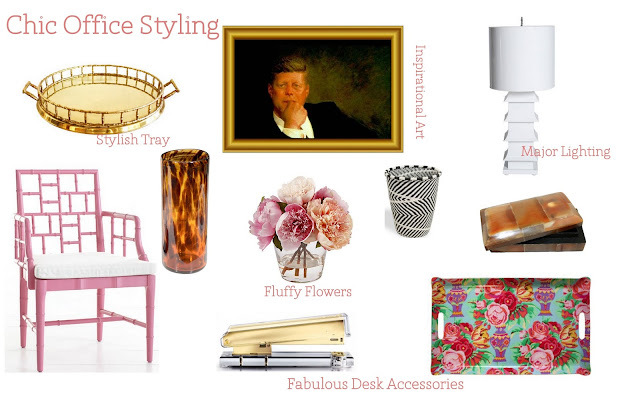 LOVE your mood board for a chic desk...I desperately need to give my own a serious makeover. Its a mound of clutter, papers, fabrics,etc....even my coffee mug is getting buried! Think what I really need is a new and MUCH bigger desk! I love the messiness yet strategically placed items on the first desk! Good luck with your new job! i work from home about one day a week and i can seriously do nothing if my space isn't in order and looking pretty. unfortunately, we rent, and the office came with a monstrous, hideous desk and bookcase which i want to paint so bad i can't stand it. i have tried to make due with what we have but it is hard. i can't wait to start from scratch and gather some of these fabulous accessories. hope you have a great first day! I am in major need of a few more stylin' accessories. I can't wait for some "new house" tour posts. 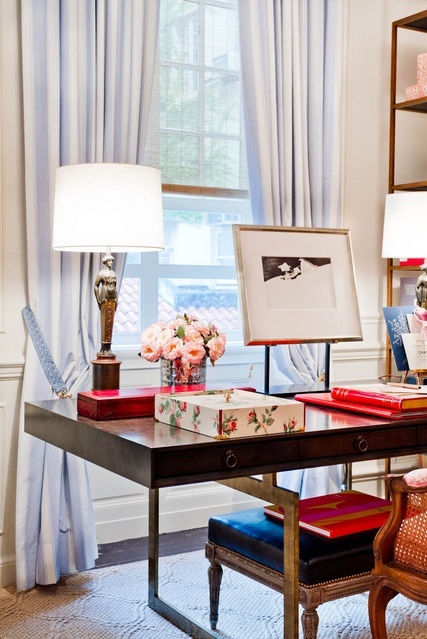 Lovely inspiration and fabulous picks - makes me want to re-do our office (again)! That stapler is just the best! Congrats on the new job! I know what it's like to move into a new house and start a new job all in the same month. It is beyond hectic!!! Good luck today. Ahhh that chair is my favorite...I have it bookmarked!! And I got that tray for Christmas and I just adore it! It's the perfect catch all...I can't wait to see what you come up with!! I never go into the "office" space...not a full room. Because it depresses me so. Good luck getting yours sorted. Happy first day at the new job. You can never go wrong with fresh flowers! I would love my desk to look like any of the above. Its in sore need of a makeover. the office looks fantastic - love the chair and love love love the tray!